The Latvian capital of Riga is chock a block full of classic architecture, old town surprises with quaint cobbled streets, as well as modern bars and restaurants. Bedecked in thousands of lights of different colours, Christmas is a beautiful time of year to visit this enchanting city! 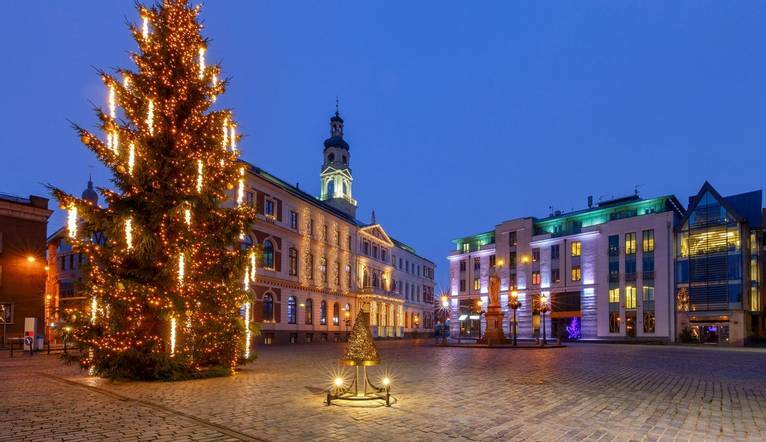 From the twinkling lights in the shop windows to the fairytale Christmas tree in the main square, Riga shimmers over the festive period. Currently dating back to 1201, the magnificent UNESCO listed Old Town is home to stunning architecture, narrow historic streets and passages. Our guided tour on Christmas Eve introduces us to the main sights, after which we can enjoy a taste of the local cuisine, sampling cheeses, smoked meats and the traditional ‘Rupjmaize’ or black bread. Also included is a visit to the Contemporary Art Museum which is inspired by Venetian Renaissance palaces and features gold statues on the ceilings of the old exhibition halls, a crystal fireplace and four permanent expositions. Fabulous Christmas markets are on over December so don’t forget to try the hot wine and delicious gingerbread cookies. There is the option to attend a wonderful classical ballet performance and full details will be provided as soon as they are available. Christmas Day is completely at our leisure to relax in the hotel enjoying the facilities or taking a stroll on a different Christmas tour before a gala dinner and entertainment. With its wonderful location right in the centre of the city right, this hotel puts us in the perfect place from which to explore the beautiful Old Town. This stylish hotel offers two restaurants, lobby bar and fashionable Skyline Bar on the 26th floor with fantastic views over the city. Relax after a long day in the spa enjoying the 18m swimming pool, open-air vitality pool, sauna and steam rooms (check opening times). Bedrooms come with air-conditioning, minibar, tea/coffee-making facilities, hairdryer and free Wi-Fi. Ballet Performance – currently £104. Must be pre-booked 1 month prior to departure. The transfer from Riga Airport to the Radisson Blu Latvija Conference & Spa is approximately 25 minutes, depending on traffic. During your holiday, we have included a guided tour of the the city as well as entrance to the Contemporary Art Gallery and a local food tasting. Riga is such a lovely city with so much to see and do, your Tour Leader will be able to advise of excursions you may like to participate in or good places to visit. Ballet Performance - further details to be advised. To be pre-booked 1 month prior to departure. Currently £104.00.